Industrial scale deforestation destroys 26 billion trees each year, and while there are a number of initiatives — such as Supply Change and The Rainforest Connection — aiming to lessen this number, startup BioCarbon Engineering is concentrating its efforts on damage control by pioneering drone reforestation. The world currently replants approximately 15 billion trees per year. Hand planting trees, which until now has been the primary method available, is both costly and time-consuming, which explains the worrying shortfall in reforestation. 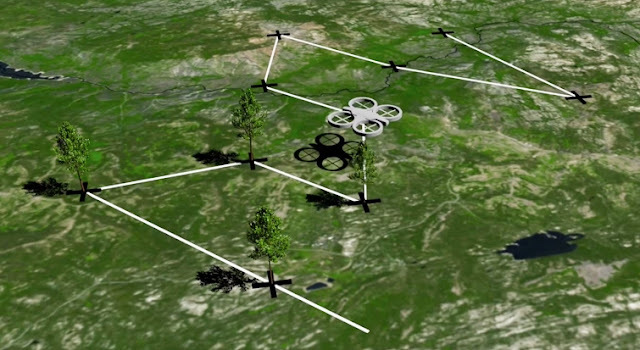 Now, BioCarbon Engineering — led by former NASA engineer Lauren Fletcher — are proposing an alternative: the company plans to plant one billion trees a year, using multipurpose drones. The UAVs will first map the terrain of effected areas and then carry out precision planting of pregerminated seeds. Two operators are expected to employ multiple UAVs, which can shoot the seeds at a rate of 10 pellets per minute, totalling 36,000 trees in a day. The seeds would be covered with a nutritious hydrogel, making them more likely to flourish and BioCarbon Engineering hope to collaborate with local reforestation organizations to ensure they satisfy the biodiversity needs of each region, restoring ecosystems rather than creating fragile monocultures. The startup suggests that their method could cost 85 percent less than traditional methods. Responses to "Reforestation drones could plant one billion trees a year (Video)"
Right now replanting trees offers employment to someone or several people. My biggest question is what happens to the 85% that it saves. You have put people out of work so is that 85% going into the public aid department? Because it might be needed there if those peoples don't have an education enough to get another job. Are you going to reeducate these people? That is another good place for that 85%. I love trees and cringe every time I see a truck load of logs go by me. We have taken most of the hardwoods and it takes decades to regrow those. I do not think drones is the answer for everything of course the camera on there could alert you to the pot plants growing in many of our national forest today.